The government just won't give up trying to shove the $1 coin into the pocketbooks of recalcitrant Americans. Between 1979 and November, 2009, over $4 billion worth of these coins have been minted, and few of us could find one in our pockets today (unless you've been using the stamp machines at the post office. or riding the New York City subways). Nonetheless, a new $1 coin may be in our future, if an argument laid out in a new Government Accountability Office report to Congress to kill the $1 bill finds traction.The argument in favor of the $1 coin is the same as it long has been; it costs 2.7 cents to produce a dollar bill, which circulates an average of 40 months. A coin, produced for 15 cents, will circulate for an estimated 30 years. There are today around $9.5 billion paper dollars in circulation. The GAO estimates that switching to coin dollars would save the government around $5.5 billion over the next 30 years. A wild card in this scenario is the future of digital money, such as the use of cell phones to pay for the types of items for which one would typically pay cash. This could reduce the number of dollar coins needed. Around $1.1 billion of coins remain in the federal coffers today, enough to seed circulation at current levels for 13 years. Should the U.S. switch to coin-only, however, the GAO believes we'll need to print more dollar coins than we would have dollar bills, due to our tendency to squirrel away change in a jar. They estimate this at a 1.5 to 1 ratio. The report notes that many countries, including Canada, the UK, France, Russia, Japan and New Zealand were successful in injecting coins into circulation in place of paper by discontinuing the paper money of the same denomination. The same argument was made by the GAO in two earlier reports, but both times the discontinuation of the paper dollar was denied, the death knell for the $1 coin. Why not discontinue the paper dollar? Because surveys and use patterns have shown than Americans prefer the paper dollars. The study cites a 2006 Gallup poll in which 79% of respondents opposed replacing the paper dollar with a coin. And today, although there are three billion dollar coins in circulation, few are actually seen on the commerce front. Back in 1995 and 1997 a bill was actually proposed (but not passed) in the U.S. Congress that would have forbade the government from discontinuing the paper dollar. The Save the Greenback Act cited both the public's distaste for the dollar coin and the cost it would represent to businesses in changing over to coins. At that time, the vending machine industry was not equipped to handle the metal dollar. 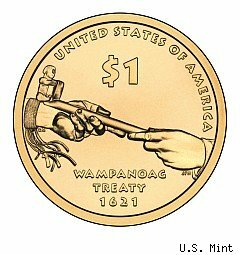 Since then, however, the industry has made great strides in accommodating this variety of dollar to the point that the National Automatic Merchandising Association now takes the position "We support the design, use and continued circulation of the U.S. $1 coin." In an era where Congress is struggling to find any loose change under the cushions to help balance the budget, expect the $1 coin to receive another hard look.